Dimitriadis 505 exhibited in a Trade Fair; Georgios Dimitriadis (to the right of the car, with glasses) and Greek minister for Industry, Mr. Martis (extreme right). 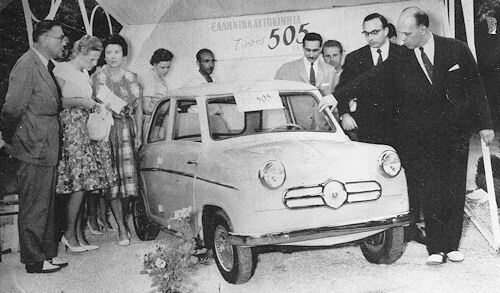 Georgios Dimitriadis a former of Bioplastic S.A. in Moschato, Athens had designed and built a light four-wheel passenger automobile (model 505) in 1958 with the intent to produce it. A tax imposed on four-wheel automobiles at the time, though, limited the car's market prospects; thus, he abandoned that plan.